WASHINGTON (RNS) — Groups of religious women are speaking out about the nomination of Brett Kavanaugh to the U.S. Supreme Court, citing their faith as they call on lawmakers to investigate allegations of sexual assault raised by Christine Blasey Ford and others. Network has been critical of Kavanaugh’s nomination for weeks, and the group’s latest statement calls on senators to launch a full investigation into the allegations against him. Network representatives are also slated to speak at a protest tentatively scheduled for Friday, the day the Senate Judiciary Committee is scheduled to vote on the nomination. The protest is organized in part by the National Council of Jewish Women. The Catholic school-educated U.S. Circuit judge is expected to deny the allegations and highlight his Catholic background during his testimony before the committee on Thursday (Sept. 27). Other faith groups have chided lawmakers who have voiced support of Kavanaugh. 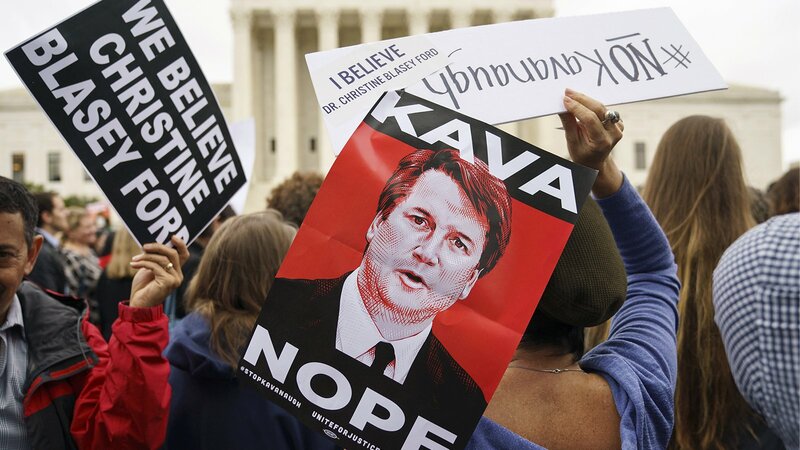 On Monday, the advocacy group Mormon Women for Ethical Government called on lawmakers to suspend confirmation proceedings until an independent investigation of the allegations against Kavanaugh can be completed. They directed their statement to four Republicans who share their faith and sit on the Senate Judiciary Committee: Orrin Hatch and Mike Lee of Utah, Mike Crapo of Idaho and Jeff Flake of Arizona. Our mutual faith teaches that any sexual abuse or assault in any context is contemptible and worthy of the most severe condemnation. Meanwhile, more than 320 Episcopal clergywomen signed a letter this week condemning remarks made by former U.S. Sen. John C. Danforth, who is also an Episcopal priest. The Missouri Republican told The New York Times last week that he felt “so terribly sorry for Kavanaugh” and that he felt similarly when Clarence Thomas faced allegations by Anita Hill of sexual misconduct during his Supreme Court nomination hearing. “No one, not least a priest of the church, should publicly shame, blame or question the motives of women who step forward to report instances of sexual abuse; Mr. Danforth should instead be calling for an in-depth examination of Dr. Blasey’s allegations,” the letter reads. The Rev. Susan Frederick-Gray, president of the Unitarian Universalist Association, is also participating in “Cancel Kavanaugh” demonstrations on Thursday near the U.S. Capitol. By contrast, some conservative faith leaders have continued to back Kavanaugh. Christian talk radio show host Sandy Rios said Ford’s allegation undermined “real” abuse survivors, Texas pastor and faith adviser to President Trump Robert Jeffress has called on the FBI to investigate “collusion” between Democrats and Ford to “derail a Supreme Court nomination,” and Liberty University — an evangelical Christian school — is reportedly sending 300 students to demonstrate this week in Washington to show support for Kavanaugh’s nomination. “Religious women’s groups” do no identity people with facts to offer. Gee, let’s get emotional about our assumptions. Wait, now an accused person has to prove charges false? Is this still America or now a Communist country? Yet another fringe group - why bother? Don't the Sisters realize this is all about abortion? All of the American Catholic religious orders have determined that "Dstributive Justice" is THE PRIME VIRTUE" to the exclusion of all other virtues, causes, good works, and issues. It is the the new " Catholic Alinskyism " which superceds all prior moral thought. More importantly, this is not a virtue that should be practiced personally by the faithful but rather it must be practiced politically through the agencies of government. It is in fact a rebirth of "liberation theology" with a new American baptism. Consequently all other moral issues such as the rights of the unborn are left in limbo awaiting the emergence of this great new allegedly just society. We have no religious left who wish to teach and mold our youth, and we are short of priests who work in parishes. Apparently there is no sense of accomplishment in these areas..... not when the front lines of the soldiers of distributive justice is where the action is. It would be interesting to count the number of Jesuits inhabiting the halls of America Magazine and then figure how many priestless parishes they could man or students they could teach. When women lose their faith, it is no different than when men lose their faith. Ideology and self-worship become fill the void. The Ten Commandments no longer exist, especially the one about not bearing false witness, which would include not making assumptions were one to exercise a rational moral mind. Men or women genuinely concerned about sexual abuse of any sort would not want outrage to be undermined whenever accusations are false. And Catholics, unless they are pseudo-Catholics and don't care about the slaughter of the unborn, would at least be skeptical of women who have openly admitted they would do anything to stop any man who could influence legal accessibility to abortion. One might say, this is another illustration of the reason why Jesus did not burden the woman with leadership and governance as wisdom enacting tough love trumps compassion every day but there are many men who are taking this limp-wristed attitude as well. There is Justice, not Social Justice or Distributive Justice. Why does any Christian demand justice knowing that if there was only Divine Justice they would all be damned. Part of the mystery of who is God is that Infinite Justice and Infinite Mercy coincide. It is not broadcast, but Catholic nuns in my lifetime have perpetrated physical, psychological and sexual abuse too. Enough of this "male behaviour evil, female behaviour perfect" sinful sexism. This comes from more than 50 years of dealing with wounded people harmed in day schools, boarding schools, orphanages and homes for "fallen women" to be kept in exile until their out-or wedlock pregnancies came to term and their babies stolen - run by nuns.